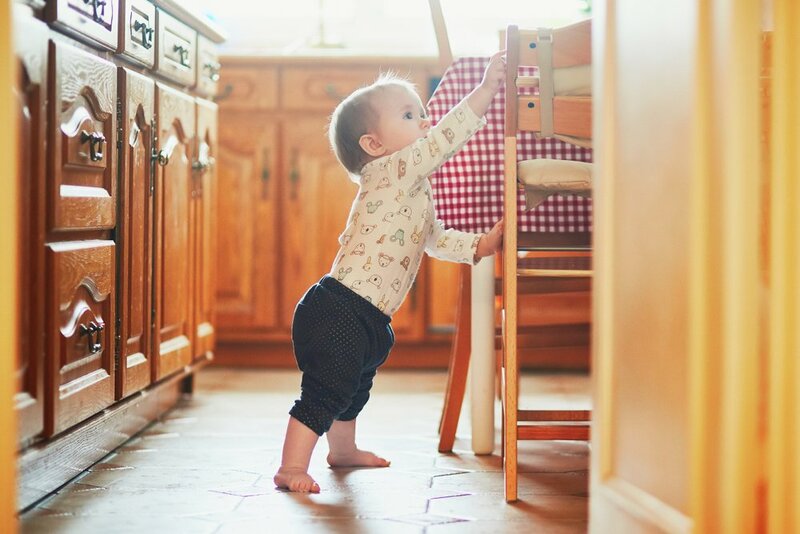 Kids love wandering into the kitchen area when they see mommy there, so make sure all the cabinets within your son’s reach have a babyproof lash on the door that prevents him from opening them. Think about the potential hazard of anything you put into the trash bins: spoiled food, discarded razor blades, or batteries. You can consider placing the trashcan under the sink and then put a baby proof lash on the door. If you have the trashcan out, you can try a safety lock. Make sure all bins have a child-resistant cover, baby proof latch, or are kept out your child’s reach. Double check the doors. Glass doors are particularly dangerous because your little may bump into them, so consider having them open or placing colorful stickers on them so your child can see something is there. Swinging doors can also be dangerous as they could knock him down, and folding doors can pinch his little fingers. So, if you have either of them, consider removing them until your child is old enough to understand how they work or putting a baby safety lock to keep them closed. You might consider placing safety finger pinch guards on all doors to keep your baby’s fingers safe. Front doors or doors that might lead outside are something to watch out as well. If the handles are low enough for him to grab or pull from, you might need to consider childproof-top locks. Keep reading more about how to prepare your home for your crawler on part 2 of this article.